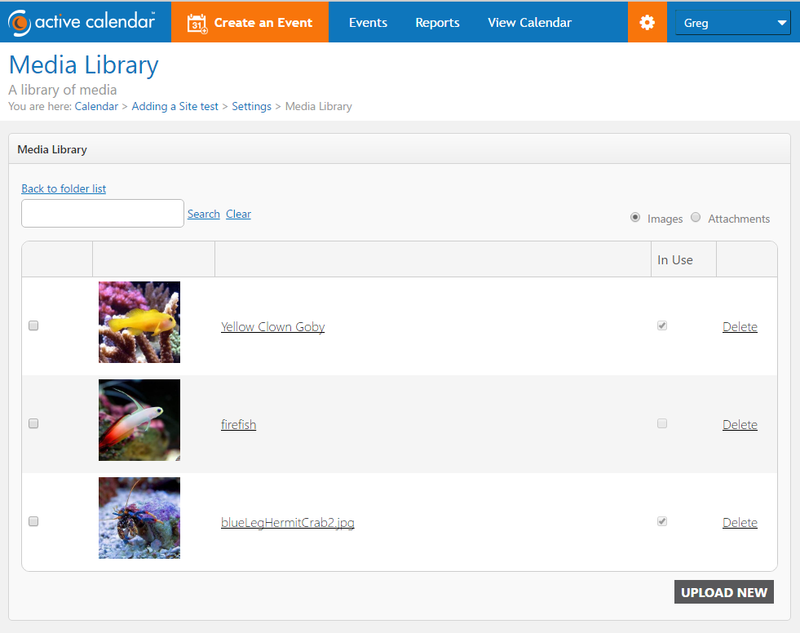 The Media Library allows you to store and maintain images and attachments to be uploaded to your events. 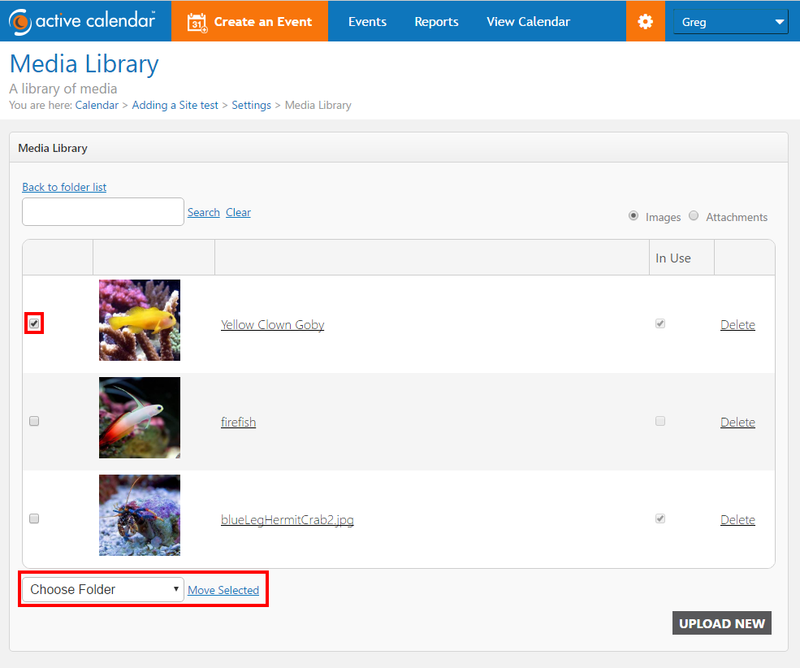 Use the media library to create an organized listing of often used or approved images and attachments. The Media Library is accessed via Site Settings. Please note, the media library is accessible only to users with a Site Role of "Admin", users with advanced permissions, and/or the media library permisson. You can access information related to user accounts here: Help Page: Set Up Users. 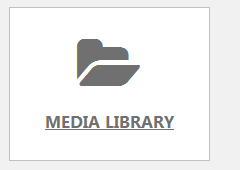 Once you have navigated to Site Settings click the Tile "Media Library". Restrict Images and Attachments to specific calendar sites. Organize Content to make it easier to find. All images that are added to the media library, unless added to a specific folder will be located in the "Default" folder. Click the "New Folder" Button.The following page will be displayed. Choose if the folder, and all its conent, should be availble to all sites, or only this specific site. Selecting the "This folder is availble to this site only" checkbox will restrict access to the folder to the current site. If the checkbox is not selected, the folder and all its conent will be available to all calendar sties. Once images or attachments have been uploaded to the media library they will be displayed in a table, using the following format. Please note, you must click on the folder name to view its contents. Thumbnail of the Image: A small "preview" of the uploaded image will be displayed. Name of the file uploaded: The name of the file will be displayed. Please note, the name displayed will be the name for the file as it was originally uploaded. In Use: A checkbox will be displayed, if checked this indicates that the file has been uploaded to an event or location. Link to Delete: Clicking this link will remove the item from the Media Library. Items can be added, removed, or moved to a different folder in the Media Library. Please note if an image or attachment is uploaded to an event and does not currently exist in the media library it will be added to the default folder. If an image or attachment is deleted from the media library, it will no longer be displayed for all events. Locate the file in it's current folder. Select the checkbox to the left of the thumbnail (images) or file name (attachements). Select the appropriate folder from the dropdown. Click the Move Selected Link. You can follow the proceeding steps to add and item to the Media Library. Event Publisher will allow you to upload images up to 3mb each. The maximum number of images that you can upload is not limited. However the total size of data in your calendar is controlled by your calendar license agreement and items in the Media Library are included in this count. Navigate to the Site Settings Area. Ensure that the radio button selection on the right is indicating "Images"
Event Publisher will allow you to upload attachments up to 10mb each. Event Publisher will allow you to upload attachments up to 10mb each. The maximum number of attachments that you can upload is not limited. However the total size of data in your calendar is controlled by your calendar license agreement and items in the Media Library are included in this count. . Ensure that the radio button selection on the right is indicating "Attachments"
You can choose to remove or delete images and attachments from the media library. If you remove an item from the Media Library it will also be removed from all events using it. You can follow the proceeding steps to add and item to the Media Library. Click the text "Delete" to the right of the library item. You can browse for items added to the media library using the search text box to the left of the browse icon. When searching for items in the media libary type your keywords in the seach box and clik the link labeled,"Search".